What is FMLA? As an employer do you know if your company is under the FMLA mandate? FMLA is the abbreviation for Family and Medical Leave Act. It is a federal law passed in 1993 by the United States Congress that requires covered employers to provide employees job-protected and unpaid leave for qualified medical and family reasons. Some states have enacted laws that mandate additional family and medical leave for workers. Therefore you should check with your respective state's department of labor to ensure that you abide by the state's regulations. What to do when you have an employee that goes on FMLA? With all the lawsuits related to the federal Family and Medical Leave Act (FMLA), human resources managers need to make sure they do everything by the book when an employee gives notice that they’ll be out for an extended period of time. Here are a few things to consider in order to ensure compliance and protect your company. Before an employee goes on intermittent leave, request FMLA recertification. 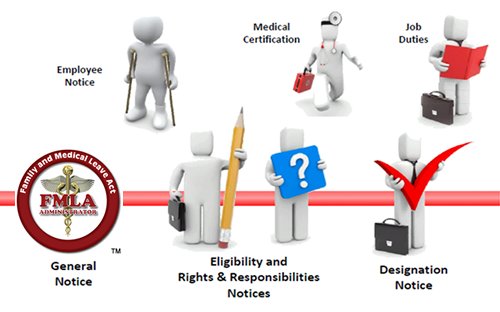 The law allows employers to request medical recertification once every 30 days under certain circumstances. Either employee or employer can decide whether a worker’s accrued paid vacation or sick days will go toward the 12 weeks of unpaid FMLA leave. Employers are allowed to request that a worker on FMLA leave call in to report his or her status. Employees are still required under the law to give adequate notice and comply with a company’s call-in policy. Supervisors need to know the ins and outs of the law, as they will likely be the first line of communication between workers and the executives who oversee leave under FMLA. Also, employers are required to have an updated FMLA poster prominently displayed somewhere in the office. Leave under FMLA is measured in “work weeks”, with intermittent or shorter leaves counting as fractions of weeks. So be sure to calculate holidays and snow days while your employee is on leave, as an office shut-down or national holiday may count toward the worker’s FMLA balance depending on whether they take a full week off or only part of it. When it’s time for an employee to return, they are entitled to their old job or an equivalent position with similar hours, expectations and salary. If he or she can no longer perform the old job due to a medical condition, make sure a termination would not violate the Americans with Disabilities Act. This certainly isn’t an exhaustive list but should prove helpful as a quick guide. Go to http://www.dol.gov/whd/fmla for more comprehensive tools, rules, and guidance.